Vermeer’s Woman in Blue Reading a Letter (ca. 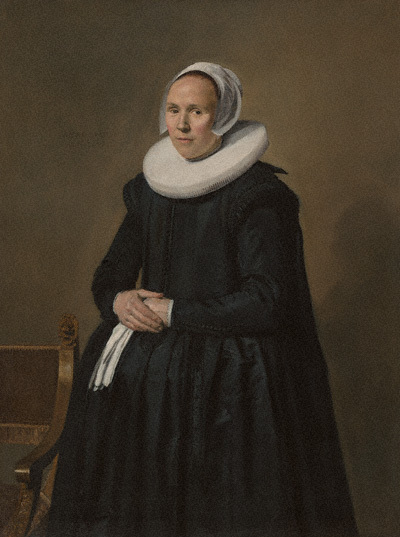 1663-64), on loan from Amsterdam’s Rijksmuseum, is being exhibited at the Getty Center in Los Angeles, daily through March 31, 2013. It will then go back to its home for the grand reopening of the Rijksmuseum on April 13, 2013, after extensive renovation. 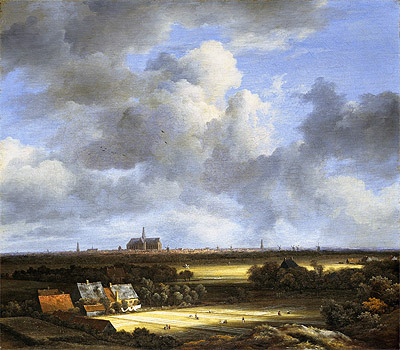 In addition, they are exhibiting a pair of large Franz Hals‘ paintings which will also go back to Amsterdam on March 31st. Apparently, these paintings have never been in the Western United States until now, and who knows when they will return. The “Dutch Mona Lisa,” Girl with a Pearl Earring, is now showing at the de Young Museum in San Francisco, along with 35 other works by the Dutch Masters! 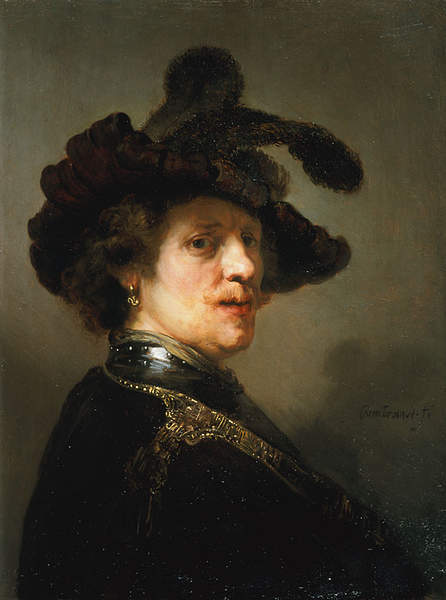 Next, it moves to the High Museum of Art in Atlanta, and last on the three-museum tour will be the Frick Collection in New York. The show will only make these three stops in the U.S. so, for many of us, this may be a once-in-a-lifetime chance to see this. The Mauritshuis is renovating and expanding, so they are sending some of their best paintings on tour. The last time (1995) Girl with a Pearl Earring was in the U.S. was at the National Gallery in Washington, where lines to see it circled the block; the time before that was in 1984 at the Met in New York City. 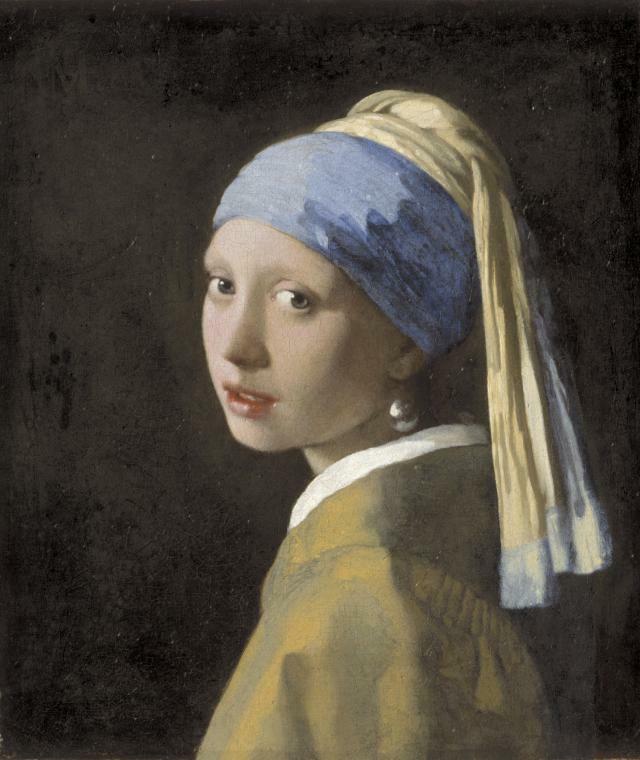 Girl with a Pearl Earring was last restored in 1994 and at that time, restorers discovered that Vermeer used organic pigments, indigo and weld, in the background. 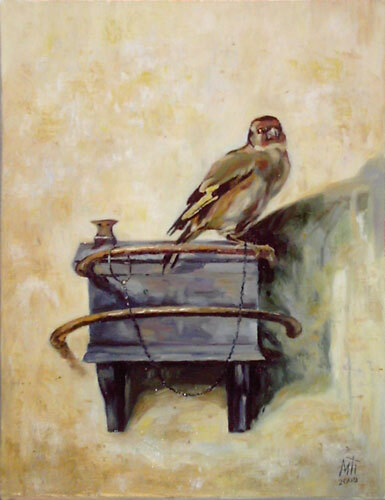 Thus, he intended it to be a deep green color accomplished with glazes, but these glazes have faded over time. Interestingly, more recent Vermeer research points to the image being a “tronie,” or “face,” a term for figures not intended to be identifiable (like a genre painting). 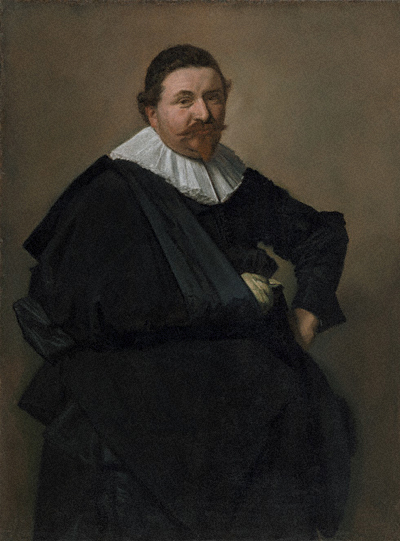 Tronies are often in elaborate or exotic costumes and the portrait, whether done using a sitter or not, would be sold without identifying the model. 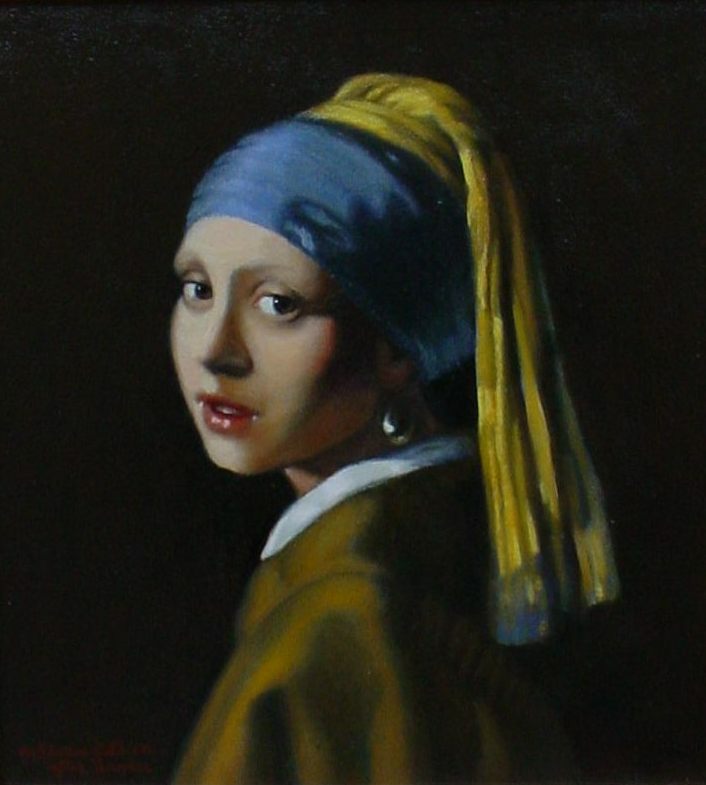 My husband and I will be going to the show in San Francisco in late March, at which time I will probably discover that I need to come back home and put some green glazes over the background of my Girl with a Pearl Earring (see post, Feb. 23, 2013). Thank goodness for art books, but there is nothing like seeing the real paintings hanging on the wall. 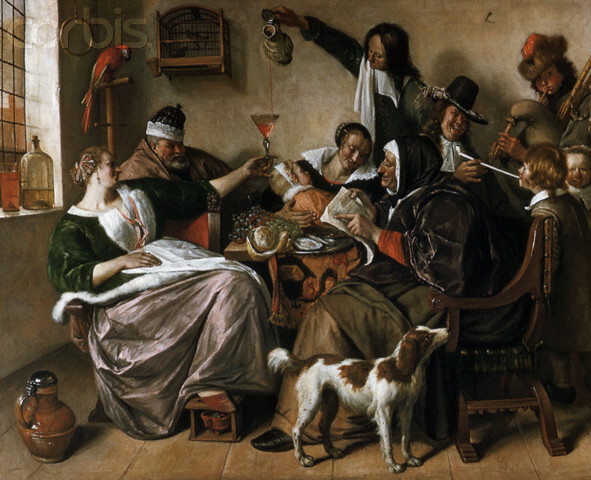 An abbreviated show of 10 paintings, including Girl with a Pearl Earring by Johannes Vermeer, The Goldfinch by Carel Fabritius, and As the Old Sing, So Twitter the Young and Girl Eating Oysters by Jan Steen. As promised in yesterday’s “comments,” here is my copy of Vermeer‘s Girl with a Pearl Earring. In future, I will take you through my process–a quite involved one, but it speaks for itself. It is not for everyone’s temperament, and does require much patience. Certainly it isn’t the only method I use, but it does produce good paintings; and of course, there are all the planning, sketches, and design preliminaries one goes through. More on this later, as I bring it together for you in a logical and, what I hope will be, an easy to understand method.